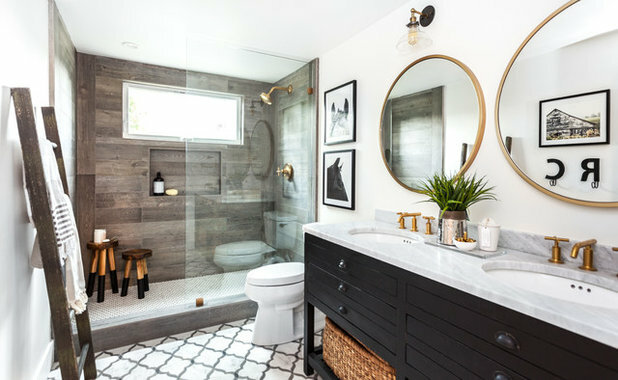 The most popular of all bathroom photos uploaded to Houzz this year covered a wide range of styles, from sleek minimalist looks to rooms packed with farmhouse-inspired details. Even with all the variety, certain elements appeared again and again. Among them: compact spaces with the latest smart storage solutions, frameless glass shower surrounds, larger shower stalls in place of tub-shower combos, floating and furniture-like vanities, warm metal fixtures and floor-to-ceiling tile. See for yourself in the 20 most popular new bathrooms of 2017 (in reverse order), as measured by how many people saved them to their ideabooks this year. A conundrum some homeowners face: How to design the bathroom their kids use every day in a way that also will be inviting for overnight guests? Here, a slate floor, marble countertop and painted vanity add beauty while two sinks, a tub-shower combo and a playful ruffled shower curtain suit family life. Notable detail: Limiting expensive mosaic tile to an accent stripe is a great way to get the most bang for your buck. 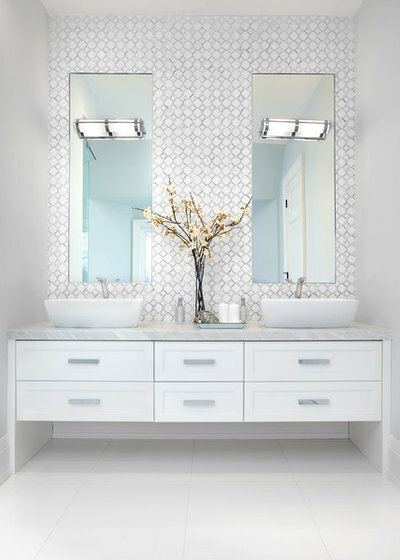 Tall mirrors stand up to the soaring height of this bathroom and break up the expanse of that beautiful backsplash tile by just the right amount. 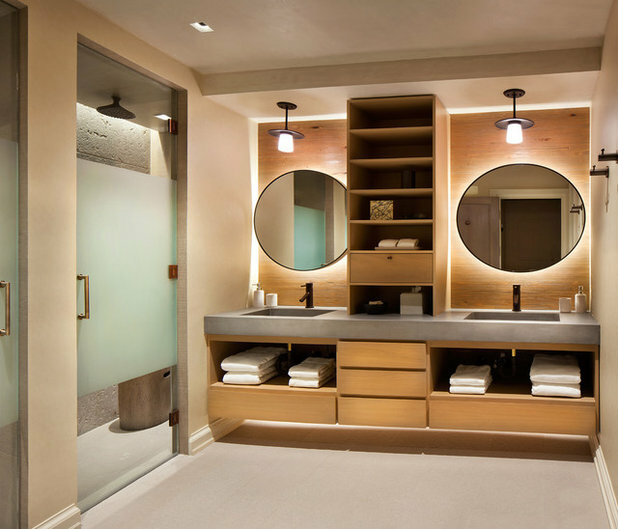 Notable detail: Mirror-mounted sconces maintain the look. Sconces flanking the mirrors could have clunked up the clean design. 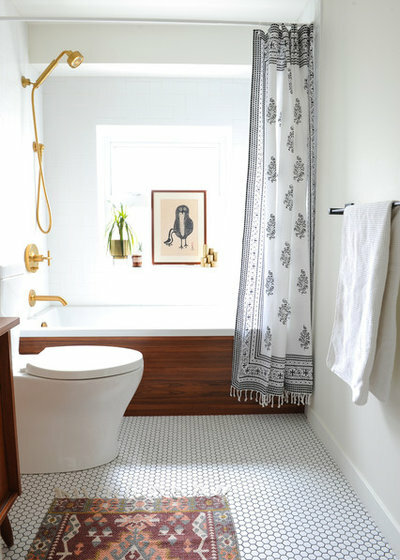 Brushed gold fixtures and a teak wood bathtub surround enliven this 42-square-foot bathroom. A toilet with minimalist lines keeps things simple, while a boho shower curtain brings in eclectic pattern. Notable detail: It’s hard to make out in the photo, but they repurposed a midcentury modern Craigslist cabinet into the vanity, which you can see here. You Can Turn That Into a Bathroom Vanity? Now this is fun: This bathroom and two others that made the top 20 are all in the same house. See if you can guess the other two, then click on the photo, look to the right and click on “Other Photos in This Project” to see if you nailed it. Notable detail: The tall legs on the vanity give it a freestanding furniture look. It looks more like a chest of drawers than a vanity. This luxe combination of materials is continuing its popularity streak. Details like the millwork, crystal knobs and glass shelves enhance the look. But what I really want to know is, do those bathtub neck pillows work? Please let me know in the Comments section! Notable detail: The floor’s tile is laid out to look much like a runner rug. Located on a horse farm, this bathroom combines some equestrian details with unexpected touches like the Moroccan-style floor tile and brushed gold finishes. 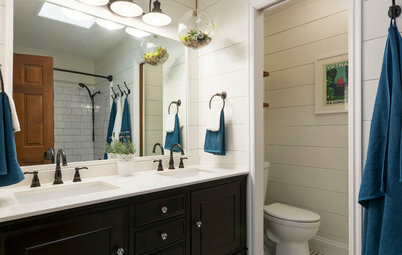 Notable detail: The designer had the tiles on the shower fixture wall arranged to resemble an old barn door. Backlit bathroom mirrors create a pleasing glow when you’re entering the bathroom in the middle of the night. This design takes the glow to another whole layer: backlit floating panels behind the backlit mirrors. Notable detail: The thick concrete counter trend seemed to gain steam in 2017. 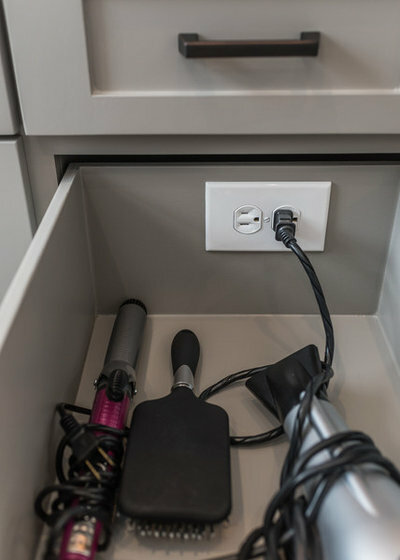 Many homeowners are opting for the convenience of hidden outlets in drawers, whether for charging stations, electric shavers or hair appliances like you see here. Notable detail: They painted the inside of the drawers to match the outside. Many Americans still fear the splash of a wet room, a strategy our European friends are much more used to employing in tight bathrooms. 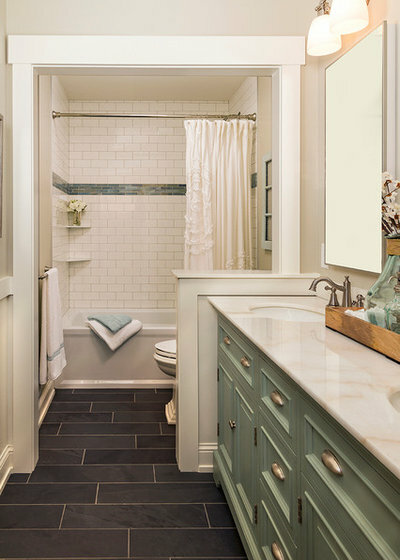 This clever design has the best of both worlds: The shower can remain open to the rest of the room for an airy feel, but a shower curtain is hiding behind the wall next to the vanity, its rod unobtrusively tucked right up next to the ceiling. Notable detail: That hunky, chunky block of a vanity makes a strong impact. If there weren’t a glass partition here, you might not even guess that the extended tub surround becomes the shower bench. 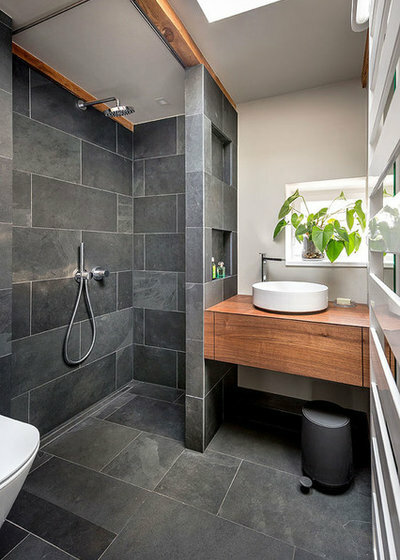 By using the same tile across the floor, up the sides of the surround and on the entire wall, this bathroom exudes a quiet and calm feeling. Notable detail: The placement of glass shelving at the far end of the shower surround keeps it from being a risk factor for head-banging. Once they got it home, these homeowners realized the contemporary styling of the vanity they’d bought at the big-box store didn’t suit them. 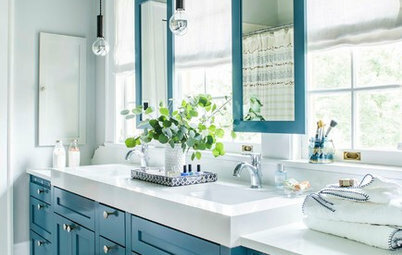 So they put in some elbow grease, applying a glaze and changing out the hardware to suit their bathroom’s farmhouse-inspired style. 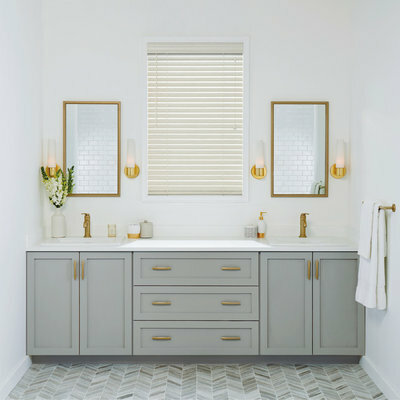 Small changes like these provide an inexpensive and easy way to make your bathroom new to you when a full renovation is not within your budget, or when you need to save some dollars within a renovation budget. Notable detail: The floor tiles are porcelain but they resemble hardwood. 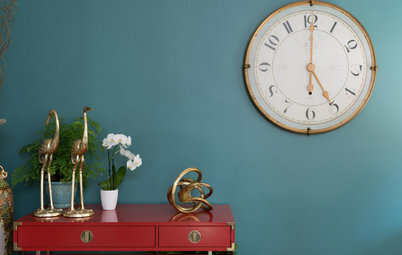 Finishes like antiqued brass and brushed gold continued to gain popularity this year. 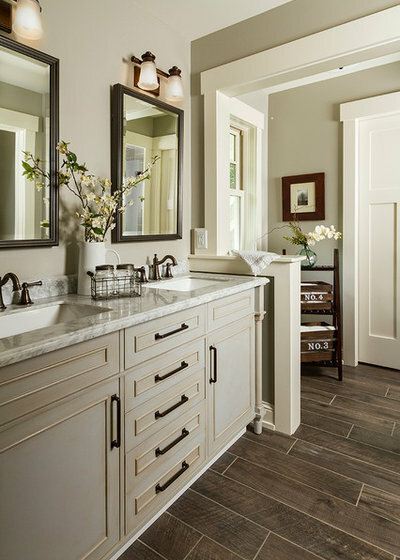 A mix of warm finishes keeps the chill away from this gray and white bathroom. Notable detail: The variation of color in those beautiful floor tiles. 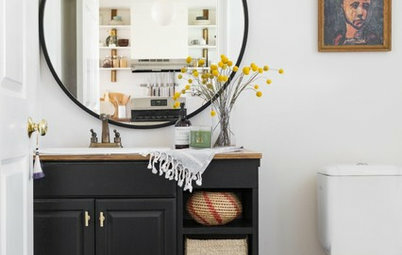 This type of farmhouse-style vanity is popping up all over Houzz. 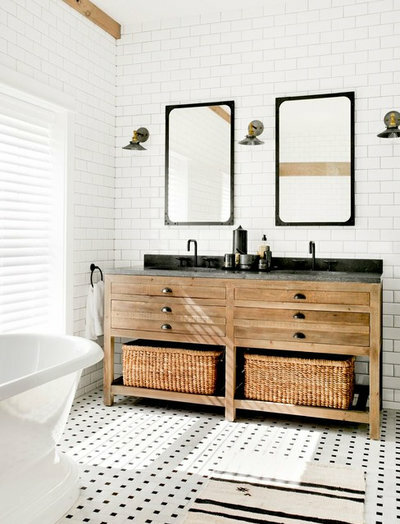 The unexpected drawer sizes, rustic wood and new silhouette have shaken up bathroom design. 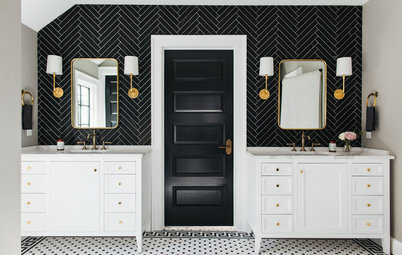 Tiling from floor to ceiling, a classic black-white floor tile and barn sconces continue the theme, while the use of all that white keeps things clean-looking and fresh. Notable detail: The just-right-sized baskets for towels on the bottom of the vanity. 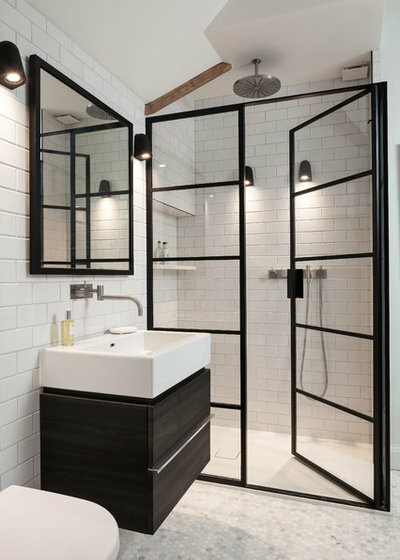 The graphic look of metal-framed shower surrounds has grown in popularity over the past few years, so much so that this once-unheard of door style is much more readily available today. 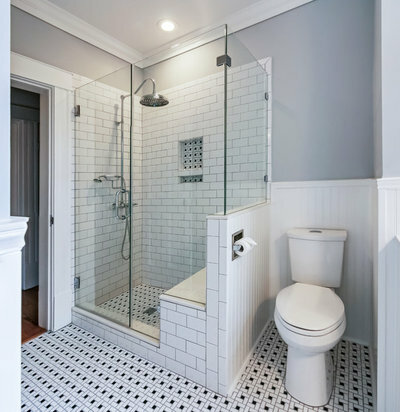 Notable detail: You may have to squint for this one, which is the point — check out the almost invisible integrated square drain on the shower floor. 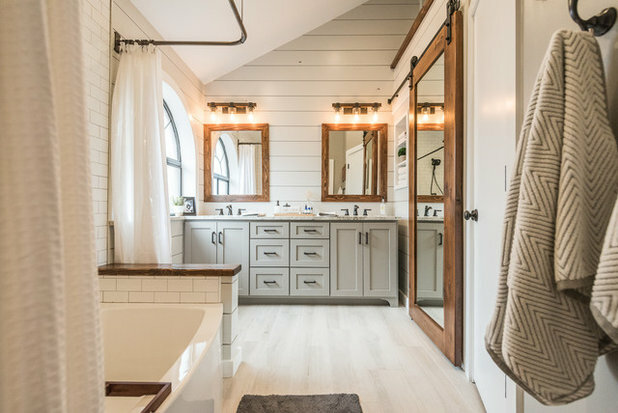 Wood accents, shiplap walls, a sliding barn door and Shaker-style cabinetry all bring farmhouse-style warmth to this transitional bath. 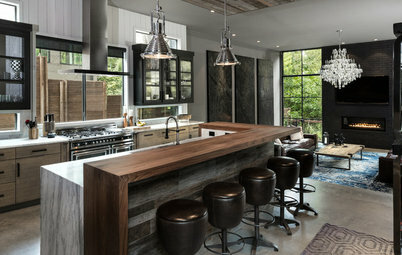 Notable detail: The mirrored sliding barn door helps bounce light around this space. 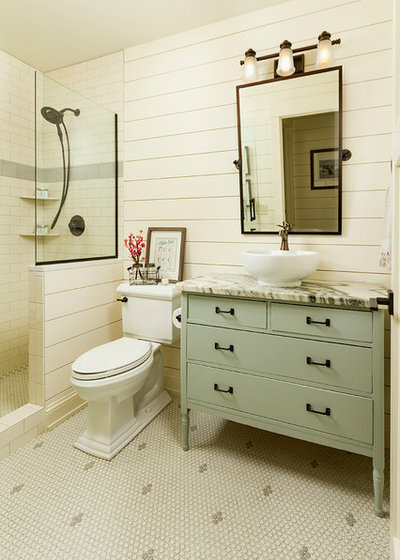 The vanity mirrors, knee-wall top and tub shelf all pick up on the wood in this piece. The seamless continuity provided by the herringbone pattern here is a stunner. And the curbless shower stall makes it even more so. 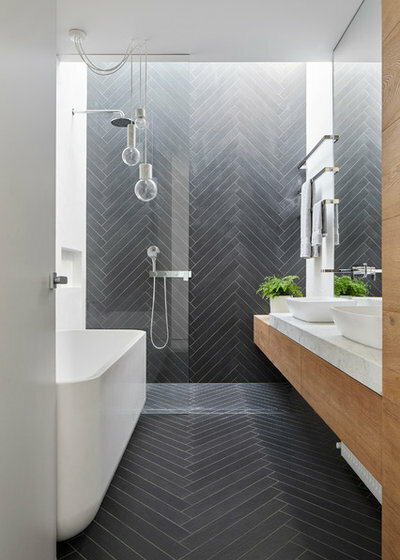 Notable details: The cantilevered vanity allows the herringbone floor to extend even farther. Chevron, Herringbone, Flame Stitch: What’s the Difference? 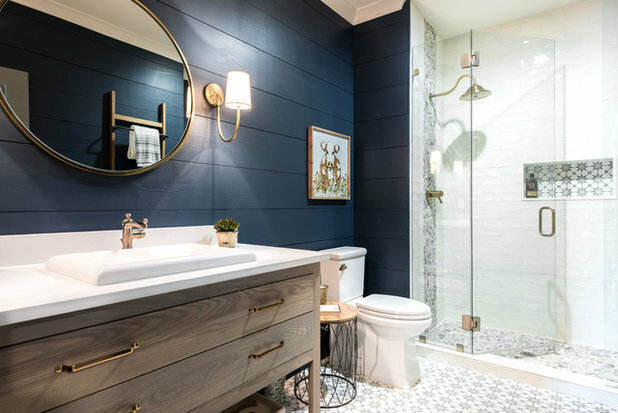 Style: Navy blue shiplap walls, antique brass finishes and crisp white tile keep this basement bathroom in shipshape. Notable detail: You’ll have to catch this one in the mirror’s reflection — an antique ladder repurposed as a towel rack. When you don’t have room for a separate water closet, there are still some ways to adjust the layout to divide your space. Here the pony wall between the shower stall and the toilet creates a more private area and a good spot to install the toilet paper roll. Notable detail: Repeating the floor tile in the shower niche. 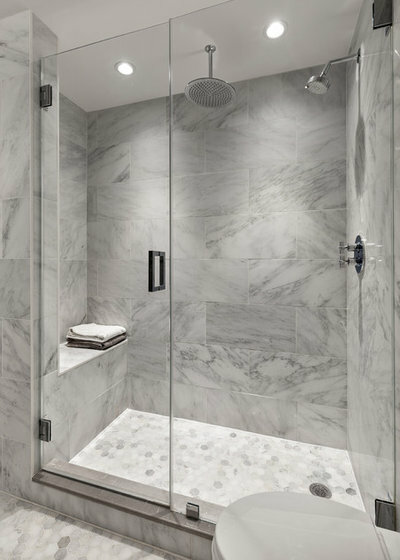 This elegant shower is luxe and calming, thanks to its beautiful gray hues. The hexagonal floor is lighter but picks up on colors from the veining. A clear glass surround keeps the view of this lovely space wide open. Notable detail: The shower door handle. It’s something you may not think of at first, but the style and finish is important. This one’s unforgiving straight lines play off the architecture of the bench and the wall tile pattern. Well, it seems the No. 1 thing people were looking for this year was savvy storage solutions for all of that bathroom stuff. 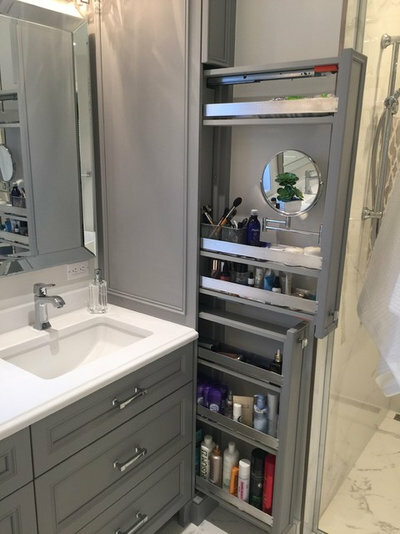 These tall, narrow pull-out cabinets make the most of the space and are conveniently located next to the vanity. 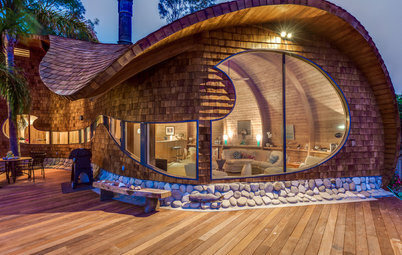 Notable detail: There’s even a makeup mirror inside for those moments when the homeowner doesn’t want to have to lean over the counter for a close-up. Will These 10 Colors Be Big in 2018? Readers saved a wide range of home styles to their Houzz ideabooks in 2017. Which idea will you borrow?